P&G recently provided some fresh data on how its online business is holding up against the competition. 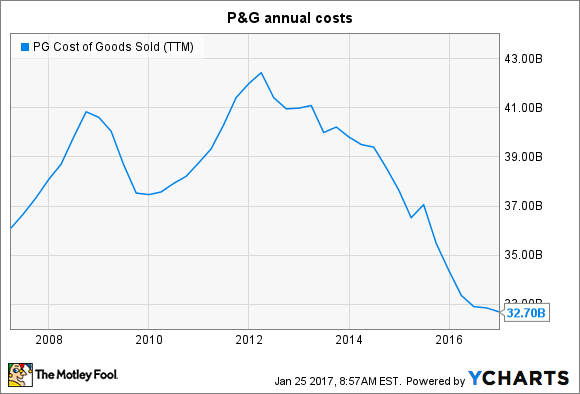 Procter & Gamble's (NYSE:PG) dominance over the consumer goods industry is at risk as more spending moves online each year. The company doesn't enjoy the same wall-to-wall coverage online, after all, that it does in retail stores, where franchises like Tide and Pampers soak up prime real estate across shopping aisles. The good news for shareholders is that management is aware of the threats and opportunities that come with e-commerce disruptions. Despite recent stumbles as it tried to protect brands like Gillette from online-based rivals, P&G is optimistic that this important sales channel will be a win for the business over time. E-commerce is now a $3 billion annual business for P&G, which equates to just under 5% of sales. A 40% annual growth rate is helping close the gap between that figure and the 8.4% of total retailing that is now taken up by online spending. E-commerce accounts for over 8% of all retailing, up from 3% in 2006. Image source: Federal Reserve Economic Data. P&G's key partners in this channel include Amazon.com, which competes in some of its strongest categories, and Target, in addition to Wal-Mart, whose retail locations account for 15% of its annual revenue. P&G's market-share position online is about equal to its offline results. That means Pampers accounts for about 30% of all digital purchases of diapers around the world, Bounty makes up 40% of all paper towel orders, and the Gillette franchise is responsible for a whopping 65% of the global blades and razors industry. These products face brutal price-based competition from online-focused rivals, but in most cases their strong brands, supplemented by P&G's aggressive marketing spending, have allowed their retailing positions to translate directly into online dominance. P&G is working hard to bring costs down to the point that it can generate the same profitability regardless of whether it's through an online sale or a traditional retailing purchase. The company has managed impressive wins on this score by cutting $1.5 billion out of annual operating expenses over the past five years. PG Cost of Goods Sold (TTM) data by YCharts. P&G expects to generate even bigger savings over the next few years by slicing an average of $2 billion out of annual costs through 2021. Executives highlighted two markets where P&G is enjoying especially strong results online. In China that channel is on pace to reach 20% of its business and should soon pass $1 billion in annual sales. Website orders account for 40% of revenue in Korea, too, where P&G has had success pushing subscription services for high-volume products like diapers and razors. The company isn't likely to achieve anything close to these figures in the $28 billion U.S. segment. However, China is its second-largest market, and so it represents an attractive picture for the direction that its other key geographies should move. In its 10-K report, P&G lists "failure to effectively compete" in the e-commerce sales channel as one of its biggest operating risks. That concern will only grow as online sales pass 10% of overall retailing and keep climbing. Executives know there will always be a place for physical stores. They're more convenient for meeting needs quickly, or for shoppers aiming to handle errands, like gas refills, banking, and pharmacy trips, that aren't confined to product purchases. Yet P&G understands that it can't fall behind in a business that's already a huge sales generator in many of its most important markets.